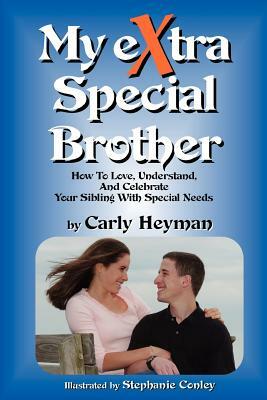 Sixteen-year-old Carly Heyman writes an endearing story of growing up with her big brother Scott, a young man who has a sweet smile, a courageous heart, and fragile X syndromethe worlds leading cause of inherited mental impairment. In her direct and honest voice, Carly reveals the ins and outs, ups and downs of daily life with Scott. She identifies challenges that siblings of a brother or sister with special needs may encounter. She shows how those challenges provide opportunities to love, laugh and learn. Through her words, Carly offers the reader a glance into how she and Scott make their relationship work. The strength of Carly and Scott as individuals, their courage, and their indomitable spirits, prevail in these pages touching hearts while teaching us how to live more fully.